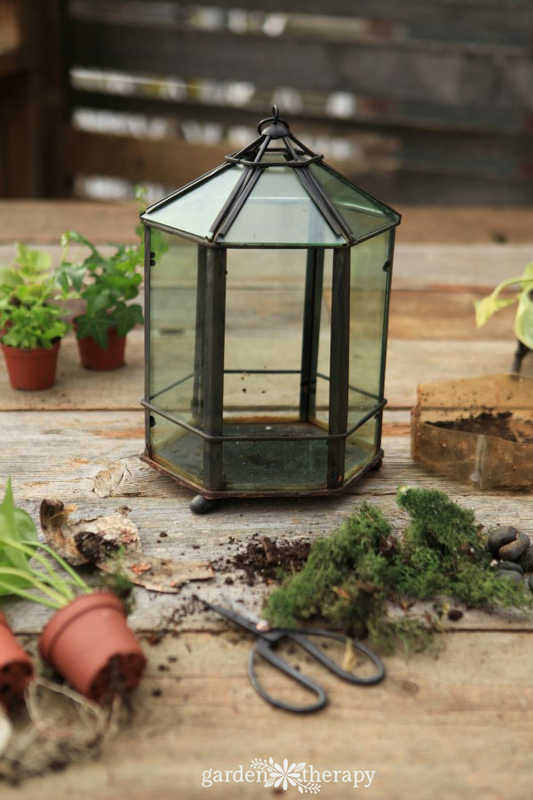 If you’ve been taking good care of your terrarium, there’s a good chance that the plants will begin to outgrow the space. Or maybe you let the watering go a bit too long and the plants are brown and crunchy. It’s Okay! It happens to the best of us. I have both overgrown plants and dead ones in the same terrarium sometimes. It doesn’t mean that it’s time to toss the whole thing out, though. 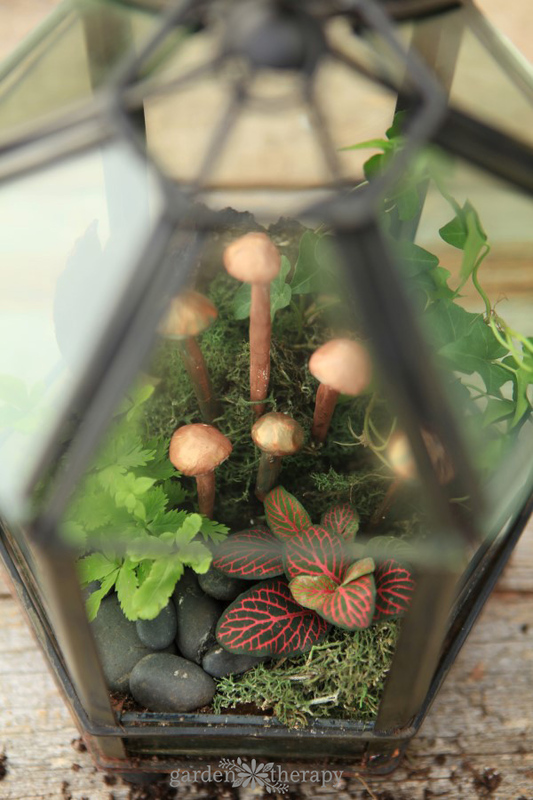 A terrarium makeover is a wonderful form of garden therapy, after all. I promise your interest in it will be as renewed as the plants are! This geometric terrarium was planted two years ago and I have lovingly tended to it and enjoyed it over that time. Now it’s starting to look a bit crazy. 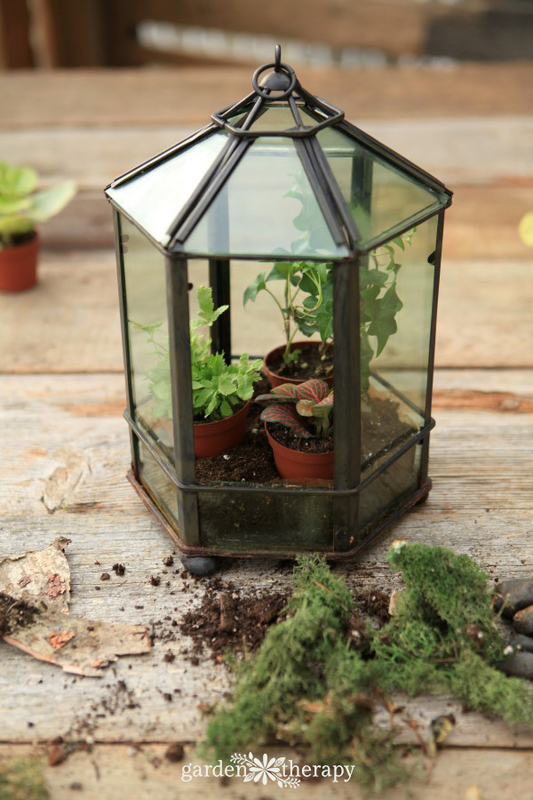 With leaves growing up to the center bending, curling, and escaping the space, this terrarium is a mess. Plus, it is very hard to keep watered. The plants are now too large for the small amount of soil that the terrarium can hold, so it’s time for a makeover. Lucky you. 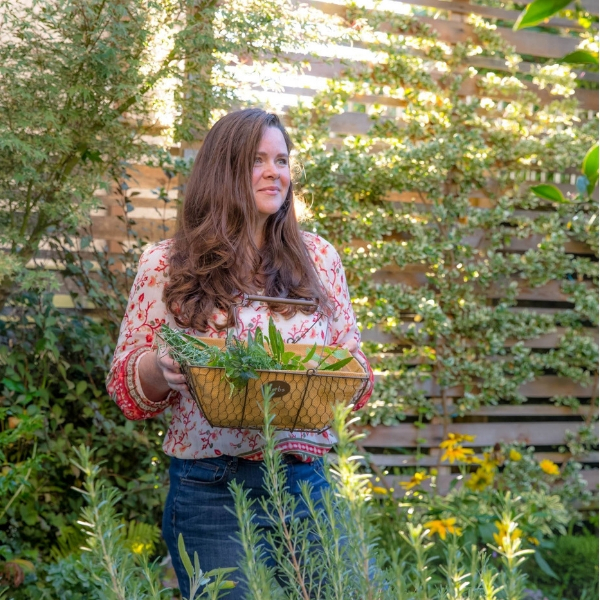 You get to completely redesign your terrarium garden with me! 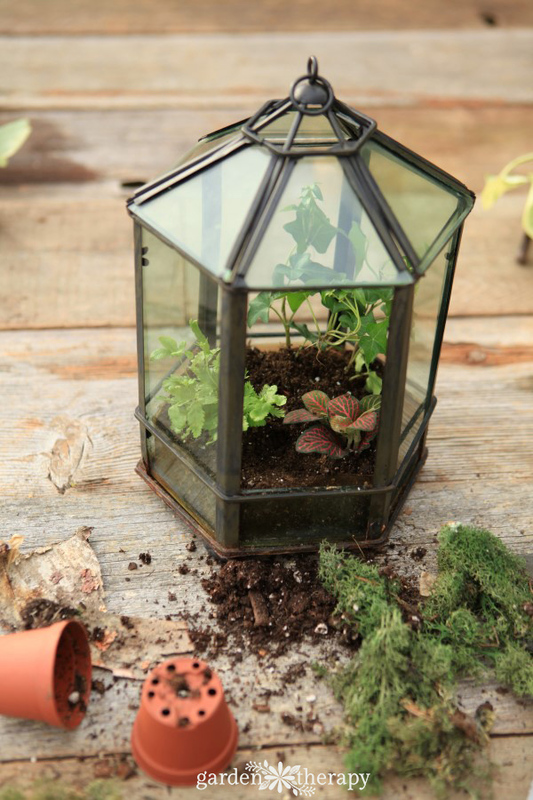 Start by removing everything in the terrarium. 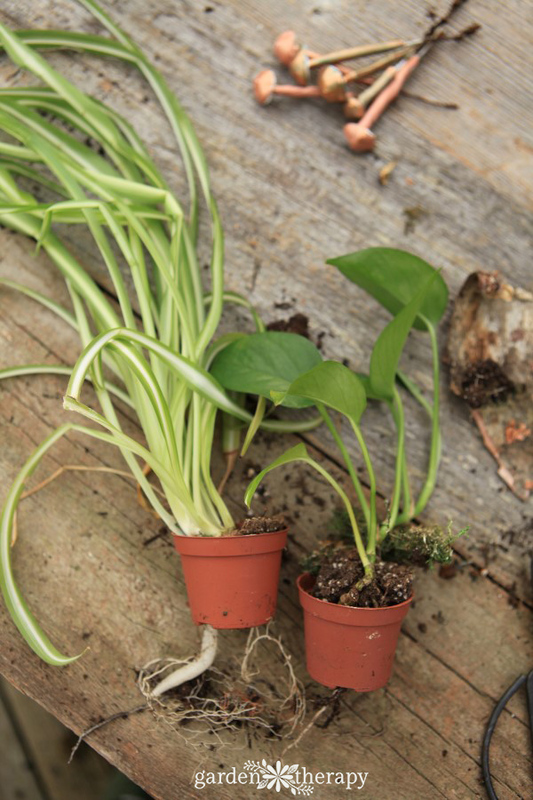 Any overgrown plants can be transplanted into larger pots while you head out and shop for some new ones. As you can see, I do not use drainage rocks in my terrarium designs. The space for the soil is too precious to give up for pebbles. Instead, I water carefully and thoughtfully. To know when to water, simply test the soil with your finger. If the soil is cool and moist, water isn’t needed. If it is dry and warm, it’s time to water. After you have watered, check back in 30 minutes. Has the water all absorbed into the soil? You can test it by tipping the terrarium to see is any water pours out. If so, you have overwatered. Soon you will learn the right amount to give the terrarium and it won’t be much of an issue. 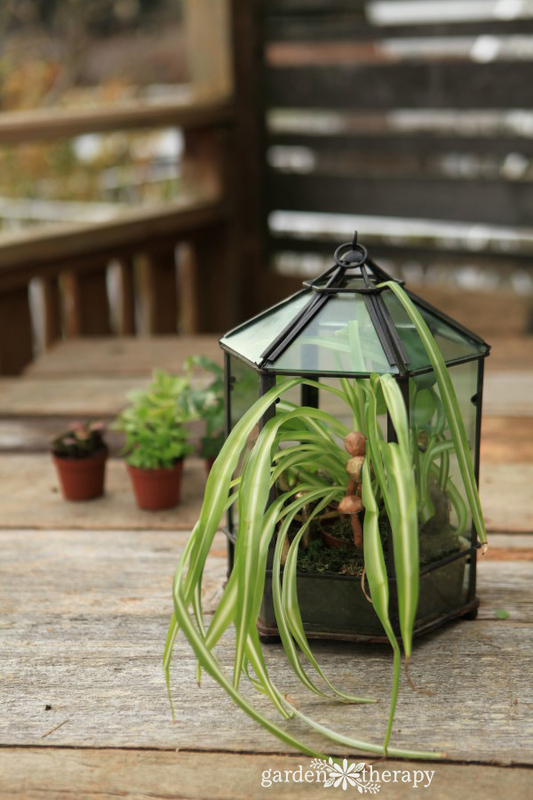 Tip: keep a thin-spouted watering can nearby so you can quickly water the terrarium if it feels dry. If one of my plants feels dry, I will go ahead and water them all. It’s not a fail-proof system, but it works for me. You can also add charcoal to the soil. It keeps the soil “sweet,” meaning that it helps to remove odor and toxins that can result from standing water. Lay out the plants on the soil to get a feel for the design. 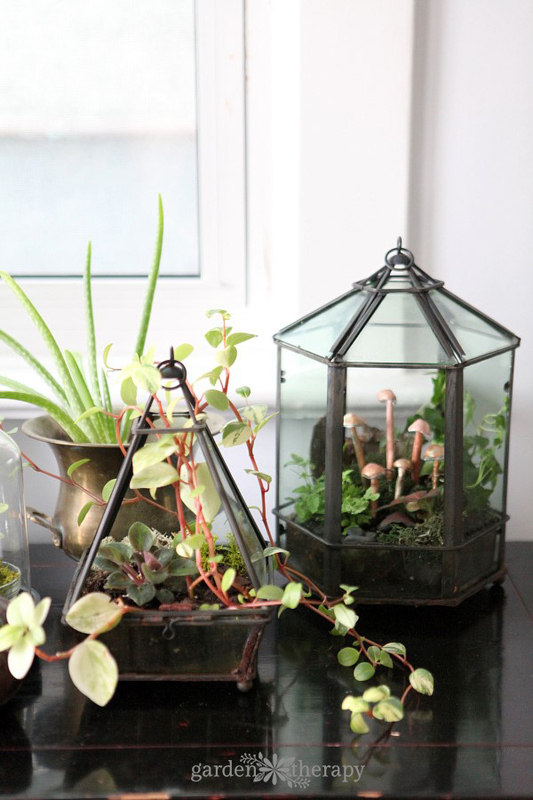 Place taller plants at the back of the terrarium and shorter ones at the front. 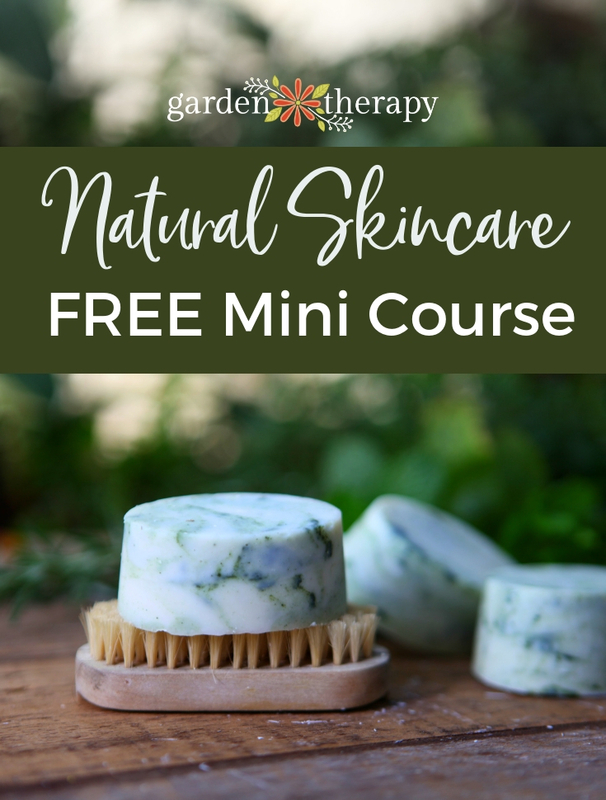 Choose complementary foliage textures and colors. If all of the plants have variegated broad leaves it will look like just one large plant. Remove the plants from the nursery pots and plant them in the soil. Water the soil well and pour off any excess water that isn’t absorbed in 30 minutes. 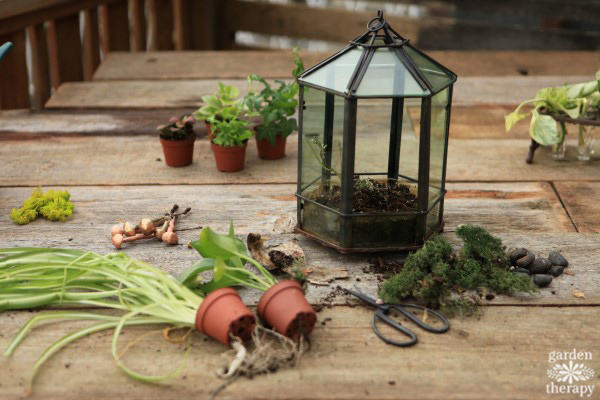 Once the plants are in, get creative with decorative elements. 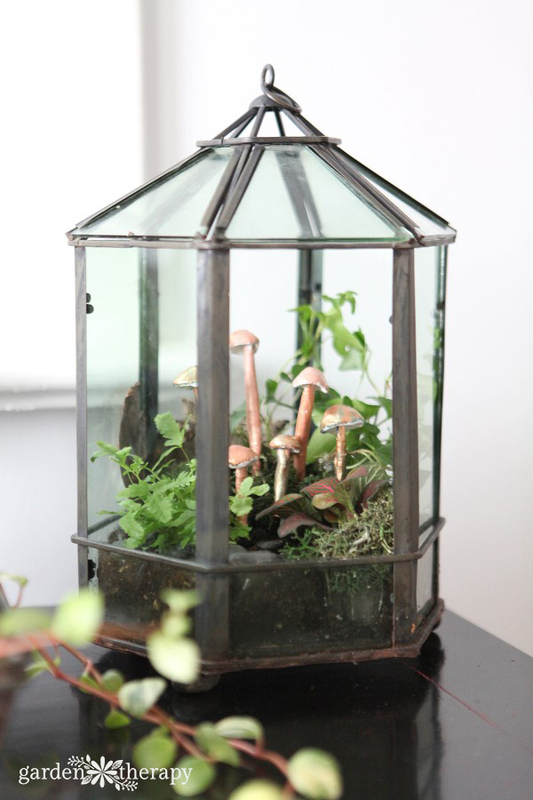 Items such as found bark and stones look right at home in a terrarium, as do moss, glass, ceramic, and miniature garden figurines. The design is where you can get creative and show off your personality!